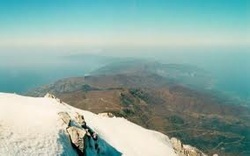 Mount Athos (Greek Άγιο Όρος, "Holy Mountain"), is a mountainous peninsula in northern Greece. 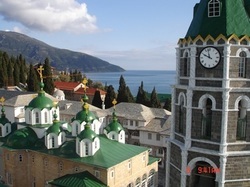 It is home to 20 Eastern Orthodox monasteries and forms an autonomous state under Greek sovereignty. 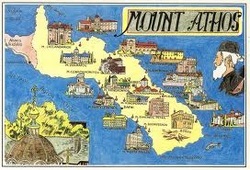 Only monks are allowed to live on Athos and the current population numbers around 1,400. 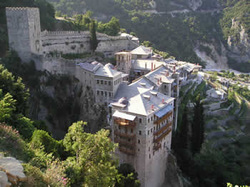 The Mount Athos peninsula is the easternmost "leg" of the larger Chalkidiki peninsula. It protrudes into the Aegean Sea for some 60 km at a width between 7 to 12 km. It covers an area of about 390 km², with the actual Mount Athos and its steep, densely forested slopes reaching up to 2,033 m.
In modern times, Mount Athos monasteries have repeatedly been struck by wildfires, including in August 1990 and in March 2004. Due to the secluded locations of the monasteries and the unavailability of suitable firefighting gear, the damages inflicted by these fires are often considerable. Mt. 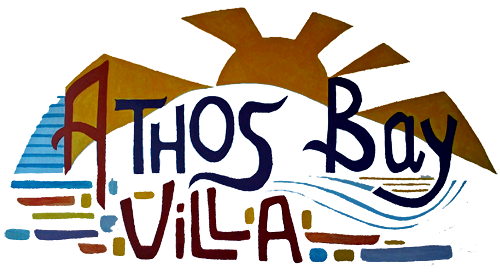 Athos as a monastic community was formally founded in 963, when the monk Athanasios established the monastery of Great Lavra, which is still the largest and most prominent of the 20 monasteries. 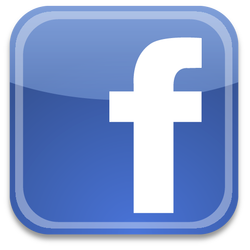 It enjoyed the protection of the emperors of the Byzantine Empire during the following centuries and its wealth and possessions grew considerably. In the 13th century, the Fourth Crusade brought new Roman Catholic overlords which forced the monks to seek protection from Pope Innocent III until the restoration of the Byzantine Empire. It was raided by Catalan mercenaries in the 14th century, a century that also saw the theological conflict over the hesychasm practised on Mount Athos and defended by Gregory Palamas. The Byzantine Empire collapsed in the 15th century and the Muslim Ottoman Empire took over. The Turks taxed the monasteries heavily, but for the most part left them alone. In 1912, during the First Balkan War, the Ottomans were forced out and after a brief conflict between Greece and Russia over sovereignty, the peninsula formally came under Greek sovereignty after World War I. The population of monks and their wealth declined over the next centuries, but was revitalized around the 19th century by the donations and new arrivals from other Eastern Orthodox countries, such as Russia, Bulgaria, Romania and Serbia. Each country came to exert its influence on individual monasteries. Visits to the peninsula are possible for men who aren't monks or even Greek Orthodox, but they need special permission in advance. Cruises around the peninsula are available to all, providing both men and women a glimpse into the secluded life of the monks of Mt. Athos.